Champagne J.P. Marniquet is almost a one-man show with Jean Pierre Marniquet (with help from his daughter) handling most of the heavy lifting including hand-riddling and disgorging the wines. As they are in the Valle de la Marne which is the land of Pinot Meunier, they embrace that sometimes denigrated variety and make it the centerpiece of their main cuvees. 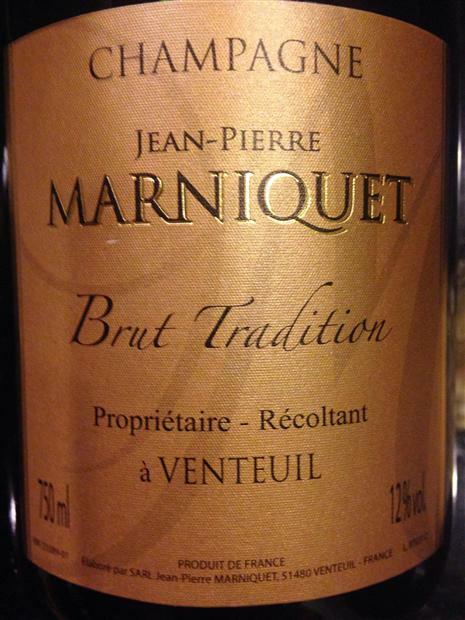 Marniquet makes real-deal farmer-fizz (estate-bottled Champagne) from grapes he grows on his own vineyards. He ages the wines in his cellar, the entrance to which looks like a Hobbit hole in the hill side across from his house. The vintage is released in the tenth year after the vintage. The prestige is released in the twentieth year after then vintage. This Prestige is unusual (in the larger world of Champagne) because it is largely Pinot Meunier (an under-rated and misunderstood Champagne variety in which Marniquet specializes) and because it got almost 19 years on the yeasts before it was disgorged. Trust me, you will be amazed. A 12% alcohol cuvee of 60% Pinot Meunier and 40% Chardonnay laid down in 1996 and disgorged in 2015. Gold-straw and fully sparkling; dry, medium-full-bodied with still fresh acidity and scant phenolics. Rich and toasty with the pure rich developed flavors of long aging. Deep mix of toasty red fruits and yeast notes with elegance from the Chardonnay and chalk. Brilliant, delicious. Gets deeper and better as it opens, breathes, and develops in the glass (use a wine glass). A masterpiece. BearScore: 100. Trust me, you will be amazed. An estate bottled blend of 50% Pinot Meunier (which is rather a lot of Pinot Meunier), 35% Chardonnay, and 15% Pinot Noir with reserve wines in the mix from a small grower-producer located in Venteuil in the Valle de la Marne west of Reims. Aged over 3 years on the yeasts in a cold, deep cellar that was originally a World War One underground hospital. Dosage is quite Brut at 6 grams per liter dissolved in reserve wines. Straw colored and fully sparkling. Dry, medium-bodied with fresh acidity. Toasty-yeasty-biscuity with lively lemony citrus and red fruit with limestone mineral earth and a hint of spice. Really very long finish. Delicious, focused, fresh, alive-in-the-mouth. I really like the biscuity taste. Yum. BearScore: 92.